Chris Jeely (Accelera Deck) is Llarks. Guitars are manipulated & mutilated by pedals to bring noise out of melody & melody out of noise. Llarks’ 5 x 5 is Chris Jeely’s treated guitar framed by abstract sounds. Each track is built around a kind of skeleton chord progression sketched out as an arpeggio, cadence or elliptical cycle. 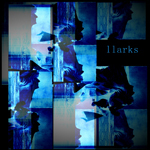 US project LLARKS is the creative vehicle of composer and musician Chris Jeely, and have been an ongoing venture since the mid 1990’s according to the Facebook page of this project. “5×5” dates back to 2015. and was released as part of US label Silber Records ongoing set of 5 minute long 5 track experimental EPs. Silber Records is home to a number of artists that ventures outside of the common boundaries of conventional music, and in the case of this brief EP by Llarks it’s all about the guitar, and then specifically guitar effects. Echoing guitar notes and fluctuating reverbs are mainstays of this material, with layered reverbs backed by firmer plucked notes, broken up and twisted sounds, delays and missing note effects as well as more psychedelic oriented plain, layered echoing and nervous guitar notes. Many of which comes across as both well developed and even conclusive: That merely 1 minute long excursions of this nature plays out as creations with a start, development and definite conclusion is slightly impressive in itself. The 5×5 series of Silber Records holds a high quality for such an experimental series of productions, and Llarks contribution is as good an example of that as anything. One to check out if guitar reverbs and guitar effects of a less dramatic nature is within your sphere of interest. Next in the series of EPs of 5 songs in 5 minutes comes from Chris Jeely aka Llarks. The 5 tracks explore a wide range of ideas with a lot of depth and creativity. Unfornunately the 5 minute limit holds the tracks back to feel like potential but incomplete ideas. Sunfall is an unconventional ambient drone tune with stuttering sounds. Opal has a scratchy distortion sound, sounding a bit like the tuning of a radio between different stations without quite reaching any. Migration is an echoing drone tune. The trouble is the music is muted too much to the extent that it sounds like its being played in a stereo in another room. Atavistic Chime has a slight rural feel to it, with a skipping guitar sound going on top of the ambient backdrop. Vestalis would work as an effective introduction to a bigger song with interesting experimental sounds and tunes but sadly doesn’t evolve much from there. There are some interesting ideas and experimental sounds here. Sadly they don’t quite evolve beyond that and end up sounding incomplete and patchy.